The battery inside the pulse generator delivers low voltage and needs to be surgically replaced every 3 to 5 years if it is a standard battery. Rechargeable battery systems may last up to 10 years, depending on usage. Your doctor will select the best type of system for you during the trial stimulation. Frequency (rate): number of times stimulation is delivered per second. Patients selected for this procedure usually have had a disability for more than 12 months and have pain in their lower back and leg (sciatica). They've typically had one or more failed spinal surgeries. Failed back surgery syndrome: failure of one or more surgeries to control persistent leg pain (sciatica). The surgery is performed on an outpatient basis in two stages: Stage 1 is a trial stimulation and Stage 2 is implantation of the permanent device. You may be scheduled for presurgical tests (e.g., blood test, electrocardiogram, chest X-ray) several days before surgery. In the doctor’s office, you will sign consent and other forms so that the surgeon knows your medical history (allergies, medicines/vitamins, bleeding history, anesthesia reactions, previous surgeries). Discuss all medications (prescription, over-the-counter, and herbal supplements) you are taking with your health care provider. Some medications need to be continued or stopped the day of surgery. Stop taking all non-steroidal anti-inflammatory medicines (Naproxen, Aspirin , Ibuprofen etc.) and blood thinners (Coumadin, Plavix, etc.) 1 to 2 weeks before surgery as directed by the doctor. Additionally, stop smoking, chewing tobacco, and drinking alcohol 1 week before and 2 weeks after surgery because these activities can cause bleeding problems. No food or drink is permitted past midnight the night before surgery. There are two parts to the procedure: placement of the lead in the epidural space of the spinal cord and placement of the pulse generator in the buttock or abdomen. There are five main steps of the procedure, which generally takes 3 to 4 hours. You are placed lying on your side or on your stomach on the operative table. The team will work with you to make sure you are comfortable before you are given light sedation. Next, the areas of your back and stomach are shaved and prepped where the leads and the generator are to be placed. Local anesthetic will be injected where incisions are to be made to prevent pain during the procedure. Placement of the surgical leads is performed with the aid of fluoroscopy (a type of X-ray). 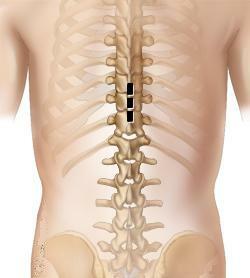 A small skin incision is made in the middle of your back (Fig. 3). The bony arch of the vertebra is exposed. 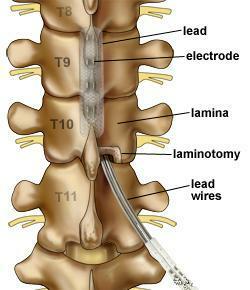 A portion of the lamina is removed (laminotomy) to allow room to place the leads. 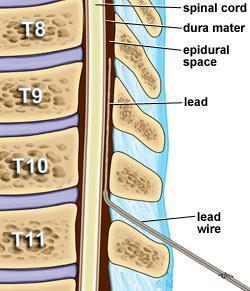 The leads are placed in the epidural space above the spinal cord and secured with sutures (Fig. 4). Your surgeon will decide how many leads and the number of electrodes on the lead to implant. You will be awakened so that you can help the doctor determine how well the stimulation covers your pain pattern without feeling any pain or discomfort from the lead implantation itself. 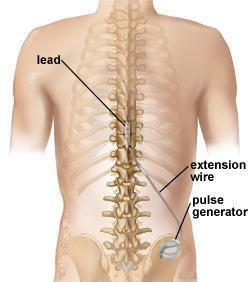 Your surgeon will decide how many leads and the number of electrodes on the lead to implant. You will be awakened so that you can help the doctor determine how well the stimulation covers your pain pattern without feeling any pain or discomfort from the lead implantation itself. Several stimulation settings will be tried and the surgeon will ask you to describe the location of any tingling you feel. These settings will be used to program the pulse generator at the end of surgery, so your feedback during this part of the surgery is important for providing you the best pain relief. Once the leads are in place, sedation is again given. An extension wire is passed under the skin from the spine, around your torso to the abdomen or buttock where the generator will be implanted. A 4 to 6 inch skin incision is made below the waistline. The surgeon creates a pocket for the generator between the skin and muscle layers. The extension wire is attached to the pulse generator. The generator is then correctly positioned under the skin and sutured to the thick fascia layer overlying the muscles. After surgery, pain is managed with narcotic medications. Because narcotic pain pills are addictive, they are used for a limited period (2 to 4 weeks). Their regular use may cause constipation, so drink lots of water and eat high fiber foods. Laxatives (e.g., Dulcolax, Senokot, Milk of Magnesia) may be bought without a prescription. Thereafter, pain is managed with acetaminophen and non-steroidal anti-inflammatory drugs (NSAIDs) (e.g., aspirin, ibuprofen, naproxen sodium). If your temperature exceeds 101° F or if the incision begins to separate or show signs of infection, such as redness, swelling, pain, or drainage. If your headache persists after 48 hours. If you have sudden severe back pain, sudden onset of leg weakness and spasm, loss of bladder and /or bowel function - this is an emergency - go to a hospital and call your surgeon. Approximately 8 days after the procedure you will come to the office to remove the sutures or staples. Programming of the pulse generator can be adjusted at this time if needed. It is important to work with your doctor to adjust your medications and refine the programming of the stimulator. 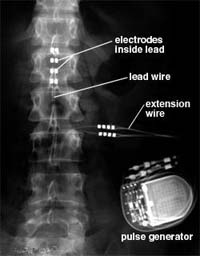 The results of spinal cord stimulation depend on strict patient selection, proper surgical technique, intra- and postoperative testing, and patient education. Stimulation does not cure the condition causing pain; it helps patients to tolerate pain. Recent results of spinal cord stimulation show good to excellent long-term relief in 70-80 % of patients suffering from chronic pain .